During the 2012 election cycle, I was a fellow with the Roosevelt Institute’s Pipeline program – as part of this fellowship, I built a web application to show electoral support for climate change action to show that climate is an “election issue”. The application allowed visitors to search for their candidate, and if the candidate was already an officeholder, the application would tweet their statement to the the person they were voting for or against, along with a link back to the full statement. It was designed to accommodate photo and video statements as well, but I ran out of time to implement them in that election cycle. The statements were then cross-referenced by candidate and state so you could see why people cared about the issue and how it affected their support. The application was built in Django with a MySQL backend. On the front end, it used JQuery and the Foundation framework for interactivity and responsive design. It connected to Google+, Facebook, and Twitter APIs for sharing. 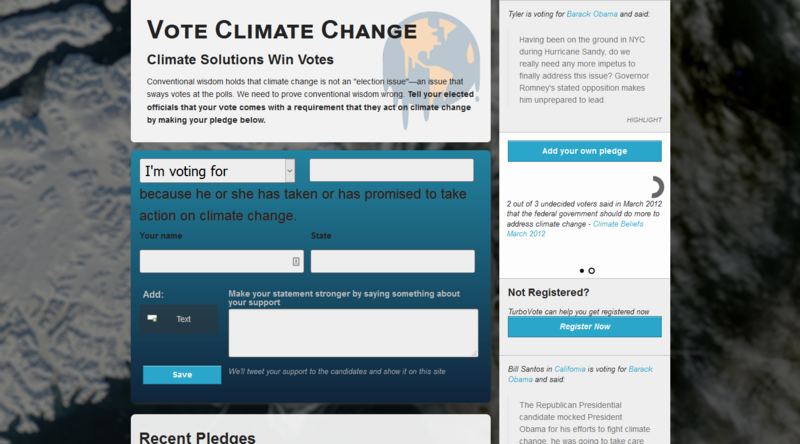 It also consumed APIs from the Sunlight Foundation for information about elected officials and their online presences. The site is now offline.